Early in the season deer rubs are made primarily to remove velvet from a deers antlers. As the rut gets closer, and a buck is feeling the effects of the mounting testosterone levels, he will rub with much more aggresion to strengthen his neck muscles for the upcoming rutting season. A buck rub isn't only a visual sign, but also tells where a buck stands in the hierarchy of the herd by leaving his scent on each rub. Dominant bucks release a stronger scent than younger bucks. The mature buck leaves his rank or social status on each rub by way of his forehead gland. Cluster Rubs usually be found near a bucks bedding area where he spends much of his time. These are very hard to hunt without bumping the wary buck from his protected bedding site. Sign Posts usually a single, random rub, used to mark a spot that the buck has been, leaving the scent from his forehead gland. The buck may or may not ever frequent this area again, but none the less leaves his mark. Rub Lines a series of rubs set up one after the other along a well travel path that the buck continually frequents. Common rub lines can be found leading to and from a buck's bedding and feeding areas. These are the most productive areas to hunt during the right time of year. 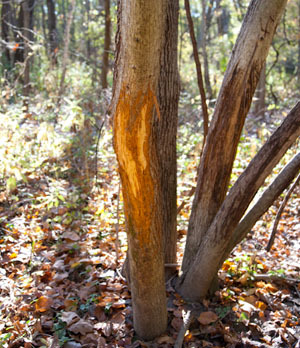 Hunting buck rub lines during the early deer hunting season, right up until the rut begins, can be very effective. Rub lines from big bucks are not hard to spot. They stick out like a sore thumb from several yards away. They are usually made on larger trees, one right after the other, making them very visible. Generally, the most mature bucks are the first to rub, so the big rubs you find in September are the ones to hunt right away. Ideally, you would like to find rubs back in the cover where the odds are higher that a buck will come past during daylight hours. Just read the rubs and look for buck scrapes. Put your treestand along a trail where there are several fresh deer scrapes. The scrapes located near heavier cover are good in the morning and evening, while deer scrapes near the edge of a field are usually better in the evenings. Rub lines will tell you more than individual rubs. Rub lines are travel routes, not just not just where a buck stopped once. If the rubs seem dried out and brown, they are old and were probably made a while ago. Old sign reveals little about a buck's current travel patterns. Look for fresh rubs, and focus on rub lines. Some rubs will even point to a specific buck. If you find odd similarities between several rubs it is likely they were all made by the same buck. Larger bucks with tall tines will often leave evidence on the trees behind the main rub giving you an idea of the rack he is carrying. Knowing how to read buck rubs can help make for a productive early hunting season. Whitetail authority Greg Miller shares 30 years of insight and tactics for hunting big bucks along their rub lines in forests and farmland woodlots. 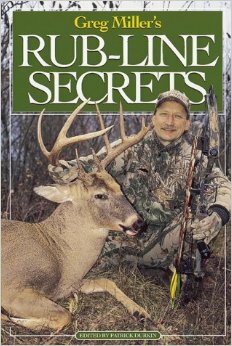 Miller supplements his teachings with more than 100 photos and illustrations to help deer hunters find, analyze, and hunt rub lines.